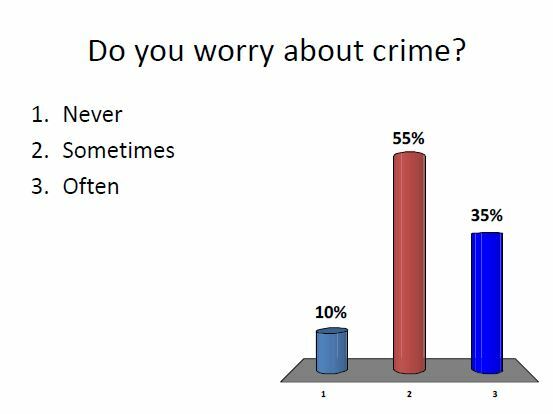 A very disappointing 90% of the group were worried about crime. This is clearly not acceptable in an Age Friendly City. At the same time fear of crime is not the same as the incidence of crime. Just over half the group are fearful of crime sometimes which may be related to time of day or particular locations within the city. It must also be related to the fact that the majority of this group are single people. FOOTNOTE: People’s sense of security could potentially be reduced by linking people together to go out. 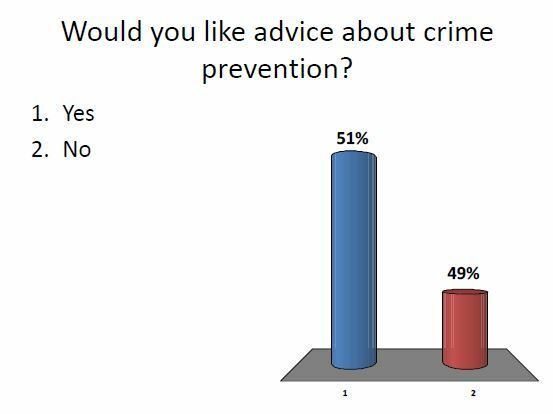 This graph distorts the figures which say that half the people would like advice about crime prevention and half would not. FOOTNOTE: A YouTube video by the crime prevention service which accurate information on the incidence of crime in Coventry may help dispel some people’s fears. Equally advice on sensible, simple crime prevention measures may help reassure people.